This week we have a double feature. 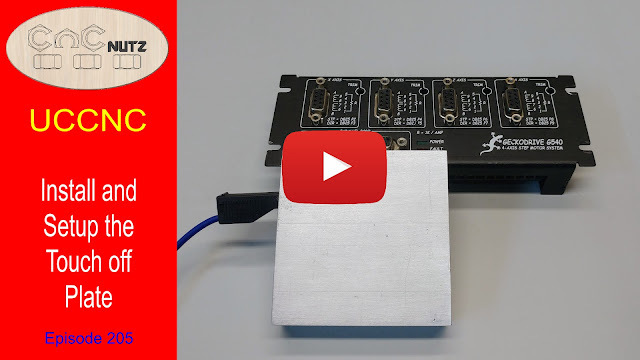 How it install a touch off plate in Mach3 and UCCNC. These have been put into different videos which will make following the install process easier. A big Thank you to John Revill who has updated his UCCNC macro and shared it with us so that we can all use this process. I have updated the Mach3 script so that the experience is now the same in both controller software's which will make interchange between these 2 software's easier for people like me who use both. Simply select the video that matches your control software and away you go. If you are curious why not watch both. The most critical part of using these scripts and macros is entering the correct plate thickness. I started by measuring mine with digital callipers and entering this figure into the script / macro. If you find the cutter is sitting above or digging into the material in the thickness test then there are a couple of possibilities. Your Z axis might not be properly calibrated or the digital callipers might be slightly off. If you are sure it is the callipers that are at fault here is a simple way of finding the correct value. If there is a gap between the cutter and the material surface then the value you entered into the Script / Macro is too small. If the cutter buries itself in the material then the value is too large and needs to be reduced. Make changes small and retry. When you test the script / Macro by entering an offset value of your material thickness no not be alarned or surprised if the cutter sits above or buries itself in the material. The cutter is set to be the value you entered above the spoilboard when you tell the Z axis to go to 0 and your material is probably under or oversized. If the discrepancy is larger than you expect then you will need to investigate further what the cause is. A simple check of the materials actual thickness will probably answer the question as it might be far thicker or thinner than you thought. If you find that you have a problem with both setting the touch off plate thickness and the offset value test seems to be way off then take a look at the Z axis calibration. If might be off. The date included in the script will allow you to check if you have the most up to date version. There may have been changes to the script for bug fixes or feature improvement so please check. If you find an issue with a script or Macro please advise me ASAP so that a fix can be found and implemented. Use the contact form on this page. The latest version is in the 2 pass with Touch test directory and is the recomended version. After entering the material offset value the plate needs to be touched to the cutter to begin the probing routine. There is a 2 second delay to replace the touch plate ontothe table top. The touch test makes sure the circuit is working correctly before probing begins to eliminate the risk of craching the cutter into the plate due to a fault or if you forget to put the ground clip on the cutter if you use one. All files are based on Big Tex's Auto zero setting script Select the script you want to use and you will need to change the Plate Thickness value to match your tool setter plate but other than the remaining values should be OK.
A readme file added to give additional setup information. Updated 30/08/2018 to add a Feedrate override resest function for safety and restore to previous setting after probe complete. This is to ensure the feedrate is correct during probing. Updated 27/10/2018 Error found in Imperial script has now been fixed and should prevent Z-plate not found error. This affects the imperial script only. Replace the Aluminium touch off plate thickness value to match your own plate. Updated 09/02/18 to remove the need to enter 0 in question box. You can now just press the enter button if you are not using an offset. eg you have the tool setter on top of the material. Updatesd 26/08/18 to add Pretouch test and Beep. Thank you for watching and I hope you find this useful. Peter,awesome information you have put together.Saved me lots of aggravation. I need your help. Im having a problem not sure if its with this script. Probe Z axis seems to be doing everything correctly except at the end i get this message "Z-Plate not found, check connection or stroke and try again"
Then the probe returns to the spot where i started the probing process and zero outs the "Z" axis. Any Ideas? Peter, I found the same error. There is a bug in the routine when the metric program was changed to the imperial program. 0.1 is a small move in metric, but a big move in imperial. This needs to be changed to 0.004 which is about 0.1mm. If Abs(ZProbePos) <= Abs(SmallDownStroke)-0.1 Then 'Check if the probe has been found"
If Abs(ZProbePos) <= Abs(SmallDownStroke)-0.004 Then 'Check if the probe has been found"
Thankyou, I have made the change. It was present in 2 locations within the script. Hopefully it will fix the problem. Thanks for a great blog. I have installed your latest metric version of the Mach3 Touch Off script. I am getting the Z-plate not found error. Do you have any ideas what the problem may be? Hi Andrew, if you have a look at the macro you will see a lone that says pretouch test = true and there is a note next to it that says if you don't want this feature change it to false. If you do this the probing will start immediately. Let me know if you have any problem. Thanks i'll check that out this evening. Just out of interest there is a new AXBB-E ethernet motion controller and breakout board combined controller available from uccnc. I've got one for a future product. It might make a good video subject. I'm not affiliated with cncdrive but their software got my machine working after years of sitting unused as a shelf in my workshop. I'm always happyto recommend something that actually works without needing a 5 year course to learn. Your you tube vids have really been a great help to me. Thank you. That did the trick. Now to try and figure out the new Probe settings page in the latest uccnc test version! maybe another item for one of your inspirational videos? ?